Green D.C.: A Healthy Alternative to Smoking Cigarettes? 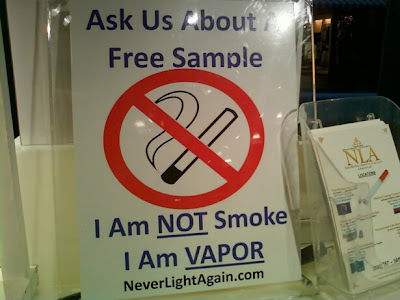 In the past few weeks I've seen electronic cigarettes for sale at The Grove in Los Angeles and Union Station in Washington, D.C. At first glance it seems this new technology satisfies the oral fixation and nicotine kick without the cancer-causing toxic tar and smoke from a traditional cigarette. You are basically inhaling vapor instead of the lung-burning smoke. There are different flavors that can be used and everything is powered by a lithium-iron battery. But is it a safe alternative to smoking cigarettes? Right now e-cigs can't be promoted as smoking cessation devices because the FDA has not approved them. During limited studies they have found diethylene glycol, one of the toxic compounds of antifreeze. But this was apparently found in a Chinese-made e-cig that isn't typical of most companies selling the product. In my opinion caution should be applied until conclusive results are formed about this product by the FDA and other regulatory agencies. And there is still no better way to stop the nicotine habit then not using cigarettes at all. But for those people who are deeply addicted smokers, the risks of traditional cigarettes far outweigh any perceived risks associated with e-cigs. Brad Rodu, a tobacco researcher at the University of Kentucky in Louisville, considers e-cigarettes a better alternative for smokers who absolutely can't break their addiction. "We can't say these are perfectly safe, but with everything we know about them we can certainly say they are vastly safer than continuing to light cigarette tobacco on fire and inhaling the 3,000 or 4,000 chemicals that cigarette smokers are doing right now," Rodu said. Electronic cigarettes are best alternate smoking cessation to quit smoking Because it contains low nicotine and its tar free, no carbon monoxide. I suggest electronic cigarettes. Electronic cigarettes runs on rechargeable batteries with charger.The electronic cigarette gives the smoker feeling of pleasure and relaxation.